For more than a decade, Rachael Ray has wowed you with her flavorful dishes on TV. And she has written one incredible collection after collection of delicious 30-minute meals. Her latest cookbook includes her most-requested recipes from fans like you and her family faves. 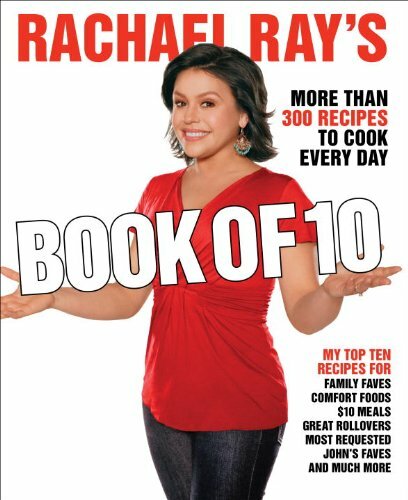 Rachael Ray's Book of 10 is jam-packed with thirty top 10 lists of recipes in all your favorite categories. Leave it to Rachael to make a book that is easy to use and fun, too! There's a chapter on Burgers with 10 Figure-Friendly Faves, 10 of John's Faves, and 10 Gut-Busters. She has lists of Date Night/Fake Outs for you and your special someone, Seafood for a Steal, and Potluck Picks. You will find a list of 10 for whatever you are making for dinner—Family Faves, Great Rollovers, Kids' Picks, and many more. There are even 10 variations on Surf 'n' Turf! Looking to show off? Try Spinach-Stuffed Steaks with Sautéed Cremini Mushrooms. How about a veggie sammie? Rachael includes Grilled Eggplant Roll-Ups and Mushroom Veggie Sloppy Sandwiches. What's great for the grill? Baby Lamb Chops with Artichoke and Tarragon Dip or try a Grilled Flank Steak Sandwich with Blue Cheese Vinaigrette–Dressed Arugula and Pears. Rachael has a recipe for you for every simple dinner, family meal, and special occasion. There are endless ideas here for what to put on the table. Grease four 6-ounce ramekins and transfer them to a foil-lined baking sheet and set aside. To make the topping, in a bowl combine the almonds, oats, sugar, and spices. Add the butter, and, with your fingers or a fork, rub the butter into the dry ingredients until large, coarse crumbs form. Set aside while you make the filling. To make the filling, put the berries into a strainer set over a bowl to catch the juices. Add the sugar and cornstarch to the juices and whisk until smooth and the starch dissolves. Gently fold the berries back into their juices, and divide the mixture among the greased ramekins. Top each filled dish with one fourth of the crumble topping and place on the baking sheet. Bake until bubbling hot and the topping is golden, about 20 minutes. Allow the crumbles to cool for at least 10 minutes before serving. RACHAEL RAY is a best-selling cookbook author and the host of Food Network's popular 30-Minute Meals, Tasty Travels, and Rachael's Vacation as well as her syndicated show, Rachael Ray. She is also the founder of Yum-o!, a charitable organization dedicated to helping parents and children develop a healthy relationship with food, and Rachael's Rescue, which funds programs that help animals in need. This is her sixteenth cookbook.